Its pretty hard for us to get photographs of the lighting rentals offered which will be an exact reflection of how it will look at your wedding or event. The reason is because the effect of your lighting rentals will be strongly effected by the lighting in the environment where you are using it, camera settings, and how the lighting itself is setup. This photo is a great example. 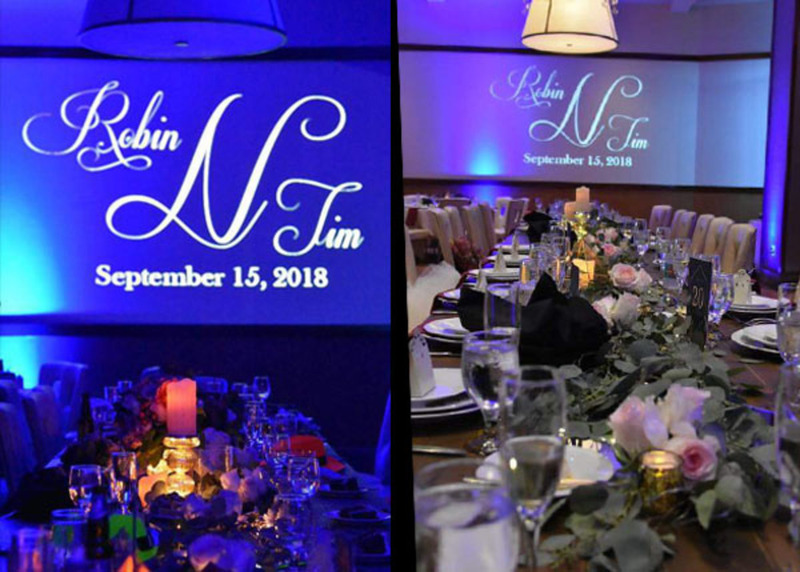 Here we have the same exact lighting equipment (a custom projection and some uplighting), in the same exact venue, but the effect and color of the lights looks completely different! Why is that? Truth is, we don't know because our customers took the photo. But 2 possible guesses: 1) Photos taken at different times during the event. The picture on the right earlier when the room is more well-lit, and then the picture on the left, later in the event when the lights were lowered OR 2) Same time, different camera settings. The key to getting the effect you want is simply to experiment. Try lowering the normal lights in the room, maybe even turning them off completely. Try moving the actual rented fixtures around to have them reflect off different areas. Try adjusting the tilt/angle of the fixtures to have them shine in a different position. Etc..